I am still making my way through the cards I made during the Honeymoon Bay Retreat. I used a simple layout, I layered the designer paper with black cardstock and covering the seam between the two patterns with a scrap. 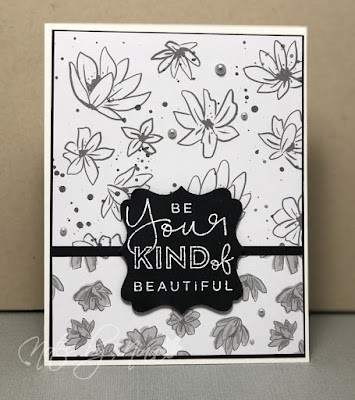 I heat embossed the sentiment in white on black and popped it up with foam tape. I finished with some light silver/ grey half pearls. Supplies: White and black cardstock, Designer Paper - Concord & 9th, Close to Heart - Create Kindness, shaped die cut, pearls. Too cool. Love positive sentiments and I’m glad you kept the focus on it by using a monochrome theme behind it. Great thinking!